The new SmartTips® chemical probes combine the well-known features of the proven Pyrex-Nitride probes from NanoWorld, such as high application versatility and compatibility with most commercial SPMs, with a highly reliable chemical coating. The patented SmartPack packaging concept ensures safe shipping and, even more important, a long shelf life of your valuable chemical probes. One SmartPack contains 5 probes; each probe is stored seperately in its own vial ensuring fresh probes each time you start a new experiment. SmartPack prevents surface contamination, oxidative degradation and/or physical tip damage. 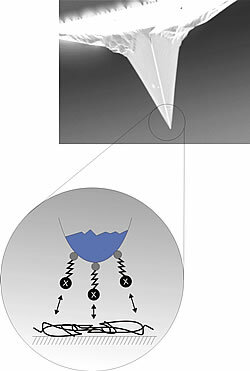 The Pyrex-Nitride probes from NanoWorld have silicon nitride cantilevers with very low force constants. The probe series features a support chip that is made of Pyrex. The TR series features two different triangular cantilevers on each side of the probe i.e. four cantilevers in total. Both sides of the chip have identical cantilevers. 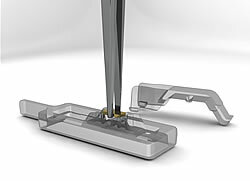 Chemical Force Microscopy (CFM) combines the force sensitivity and high special resolution of the atomic force microscope (AFM) with the possibility of chemical discrimination. This unique combination is achieved by well defined chemical modification of the AFM probe tip with specific functional groups. All cantilevers are stress compensated and have a 35 nm chromium / gold coating on the detector side ensuring good reflectivity.